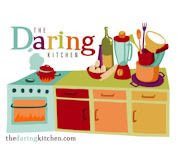 I love how you not only take on the challenge of Daring Cooks ... but also take on the challenge of making it vegan! Good job! This ricotta does sound easy. I think I'll give it a try. And your gnocchi look so cute nestled on top of the pasta. I thought gnocchi were made from potato dough — didn't realize they were made from ricotta as well. Your dinner looks so delightful! Soy free vegan ricotta gnocchi. How creative. Personally, I would have been afraid that they all would have fallen apart. I think, in my case, I will stick to the potato variety and buy them in a store. Why you are a daring cook and I am not. I made mine with nuts and tofu- I'll have to try your's - it looks delicious! Really impressive outcome. I would never have figured out how to adapt it. Oh yum! I LOVE gnocchi!! And yours turned out beautifully! I've only made them once and it wasn't very long ago....it was quite a process. And thank you for the ricotta recipe! I can't wait to give it a try! This is so cool, Diann! I am going to have to try this recipe - I knew there was a way to get around the tofu! I finally found whole wheat lasagna noodles, so I hope to try out this ricotta recipe soon! Those sound (and look) fabulous! I am definitely giving that ricotta recipe a try. Oh neato! I've always loved the daring baker blog posts, but I feel like I could actually participate in a cooking one. I'm not the world's best baker, but I feel confident in my cooking skills. I'll check it out. Your ricotta gnocchi looks terrfic. I'm a huge fan of gnocchi! i can totally see this baker’s challenge as being tough for you with not caring for pasta and having never made it, but i’m glad that you took on the challenge, Diann! that ricotta looks amazing – fluffy and yummers, fo ‘sho! i think your gnocchi is the cutest! i love ‘em all sitting in the pan together; they’re adorable – and i love your idea to put the gnocchi on top of your scrumptious sauce so that you could really taste them! mmmmmm! thanks for the ricotta recipe, Diann! totally going to have to try this soon – once the summer brings us tomatoes and squashes we’re going to make a summertime lasagna and use your ricotta recipe! i can’t wait! Wow. This looks amazing, and I'm so impressed that you veganized something containing crazy amounts of dairy and eggs, and also managed to make it soy-free! Major vegan props to you, Diann! yum! i'm drooling over yours, for sure. i love the bed of chunky veggies! Yum, that sauce looks like a ratatouille! It's definitely the kind of sauce that that gnocchi goes on top of! Thanks for the ricotta recipe! And the gnocchi looks so nicely browned. Yum. Sounds like you really lived up to the "daring" name!! Your gnocchis look perfect. I don't think I've ever had gnocchi...it's just not something that ever appealed to me. I'm a pasta girl for sure. The ricotta sounds fantastic though! I always default to tofu ricotta, so next time I'm craving it I'll have to try this one. Our family recipe for gnocchi does not call for cheese or much of anything outside of potato flour (or potatoes). These look more like cakes than the gnocchi I know BUT that doesn't take away from the fact that they look (and sound) delicious! !